The Cathedral’s Education Department has begun a recruitment drive for new education facilitator volunteers. The Department is responsible for the delivery of a variety of services to those who want to learn more about the Cathedral’s life and history. Volunteers will be asked to help in the delivery of tours, talks and workshops to students of all ages! While no experience is necessary it is helpful to have some skills around teaching or working with children. All necessary training will be provided. Prospective education volunteers must be Garda Vetted and provide character references before commencing tours/talks but the Cathedral can help them through this process. Applicants are asked to fill out the form below and select “education facilitator” as their desired role to get started. What type of tours, talks and activities are delivered? Around 5000 students visit the Cathedral every year. The majority of these are Primary School children. 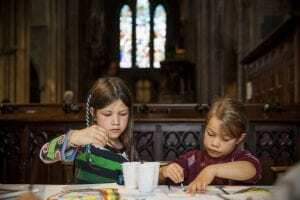 The Education Department facilitates visits to the Cathedral by offering tours, talks and activities. These are available to visiting schools free of charge. Activities (workshops) are generally themed around subjects connected to the Cathedral. A list of the workshops currently offered by the Cathedral can be found here. These activities are refreshed on an annual basis and new sessions are developed in order to keep the offer to schools fresh. Who are the Education Department? The Education Department was established in 2011 and has been responsible for some of the Cathedral’s biggest learning initiatives and events. Andrew and Ciara, the department’s two permanent staff members programme family workshops, Heritage Week events, Culture Night, and the Jonathan Swift Festival, as well as once off events such as Fallen. The Department also develop new educational resources for all visitors such as audio guides, guide books, exhibitions and leaflets.